Heat oven to 400°F. Line 15x10x1-inch pan with parchment paper or wax paper; spray paper with cooking spray. Remove pie crust from pouch; unroll on lightly floured work surface. Roll into 11-inch round; place in pan. Sprinkle cheese over crust to within 1 inch of edge. In large bowl, toss pears with lemon juice and nutmeg. Add brown sugar and flour; toss gently. Mound pear mixture on center of crust to within 2 inches of edge. Fold edge of crust over pears, pressing gently to seal (crust will not cover pears in center). Bake 30 minutes or until crust is lightly browned (filling may leak slightly during baking). Remove galette from pan and cool on cooling rack. In 1-quart heavy saucepan, heat granulated sugar over medium heat about 4 minutes, stirring frequently, until sugar is dissolved. Cook and stir 1 minute or until golden. 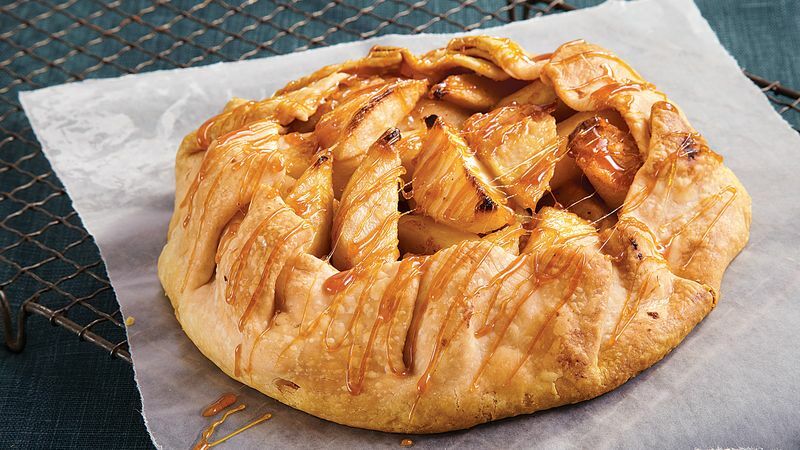 Remove from heat; drizzle caramelized sugar over galette.